If you’re like me, your weight fluctuates what almost feels like nonstop. At the beginning of the day, my jeans feel comfortable, even a little loose — by lunch time? I’m ready to pop them open at my desk. The main culprit? Bloating. If your stomach feels swollen or enlarged after eating, you may be of the 16-30% of people who experience bloating after they eat. Bloating is often caused by our diets, but can also be indicative of other health problems. If you are in pain after you eat certain foods, make sure to consult with your doctor to see if dietary changes are enough. If you’re looking to see what foods you can replace to limit bloating, we’re here to help. Here are 10 foods that cause bloating, as well as some foods you can eat instead. 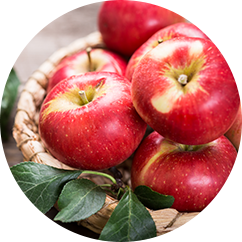 Apples are a great afternoon snack rich in fiber, antioxidants, vitamin C, and more. But with these benefits comes a reputation for causing bloating. The reason? The presence of fructose and high fiber. Both fructose and fiber can be fermented in the large intestine, which may cause gas and bloating. What to eat instead: If your apples are cooked, you may be less likely to bloat. Also try other fruits for your afternoon snack, like blueberries, grapefruit, strawberries, oranges, bananas, or mandarins. 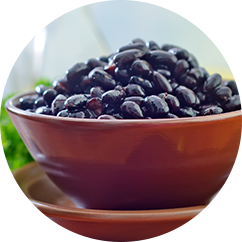 Beans have tons of proteins and healthy carbs, and are very high in fiber. But they are also high in sugars called alpha-galactosidase, which are a specific type of carb. These sugars can escape during digestion, fermented by gut bacteria in your colon, and create gas and even bloating (especially if you have irritable bowel syndrome). What to eat instead: Try pinto beans and black beans, which are easier on the digestive system, or replace beans with grains, meat, or quinoa. 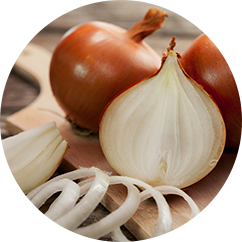 Onions are a main dietary source of fructans, which are soluble fibers that can cause bloating. Because of this, and because some people are sensitive to other compounds in onions, they are a known source of bloating and digestive discomfort. What to eat instead: Fresh herbs and other spices as an alternative to recipes that call for onions. Garlic is known for its strong, powerful flavor and numerous health benefits. But like onions, garlic also contains fructans that can cause bloating. It’s also common for people to be allergic or sensitive to other compounds in garlic, which cause bloating, belching, and gas. What to eat instead: While cooking garlic may limit any side effects, try other fresh herbs and spices in recipes that call for garlic. Wheat contains gluten, which causes major digestive problems for people with celiac disease or gluten sensitivity. These problems include bloating, gas, diarrhea, and stomach pains. They’re also a major source of sugary carbs, which can also cause digestive problems. Rye is a cereal grain that is related to wheat, and is a very nutritious source of fiber, manganese, phosphorus, copper, and B-vitamins. But since rye, like wheat, contains gluten, it can cause discomfort during digestion, especially if you’re gluten sensitive or intolerant. Because of its high fiber and gluten content, it’s a major cause of bloating in some people. Broccoli and other cruciferous veggies (cauliflower, cabbage, and brussel sprouts) are filled with fiber, vitamin C, vitamin K, iron, and potassium. Because of the high fiber content and sugary carbs present, these veggies can also cause bloating. Dairy is an excellent source of protein and calcium, and it’s present in tons of food. But 75% of the world’s population can’t break down lactose, which is the sugar found in milk. This condition is known as lactose intolerance. If you have lactose intolerance, you may experience gas, bloating, cramping, and diarrhea. Carbonated drinks like soda are a very common cause of bloating because of the high amounts of carbon dioxide. When you drink one of these beverages, you swallow a lot of gas, which can be trapped in your digestive system and result in bloating and cramping. Like carbonated drinks, beer contains carbon dioxide, but also contains tons of other ingredients — including fermentable carbs like barley, maize, wheat, rice, along with yeast and water. Because it contains both carbon dioxide and fermentable carbs (and because a lot of grains used to brew contain gluten), beer is very well known for causing bloating. Try cutting some of these foods to see what works for you, and if you’re still experiencing bad bloating or other symptoms, give your doctor a call!